On An Overgrown Path: We just try to charge a fair price and we pay our tax! We just try to charge a fair price and we pay our tax! 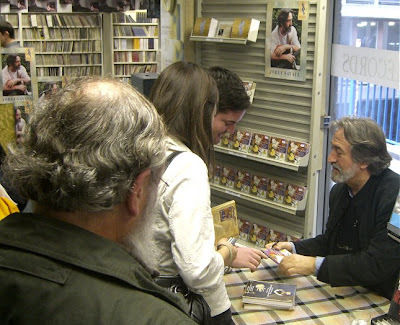 My photo shows the priceless Jordi Savall in the equally priceless classical specialist retailer Prelude Records in Norwich after his impromptu performance and signing session in 2008. Below is a recent exchange of emails between Prelude Records and me. Dear Bob Just to let you know that we have just received stock of “Balkan Spirit” (Jordi Savall et al), which you ordered in advance. The price is £12.99. We look forward to seeing you in due course. We just try to charge a fair price; and we pay our tax! I have no commercial links with Prelude Records, but do have a passionate wish that they survive the predatory attacks of Amazon and other online retailers. Ditto for Alia Vox. Photo (c) On An Overgrown Path. Also on Facebook and Twitter.